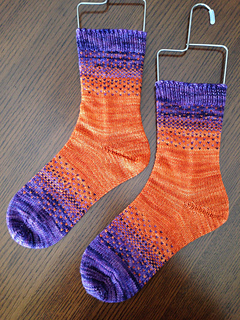 Whether you are a newbie to stranded knitting or have been knitting colorwork for years, these socks are a fun knit. 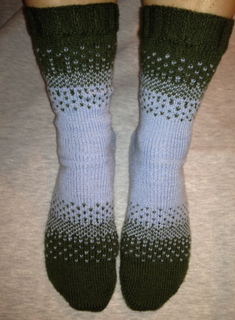 With a double layer at the ball of the foot where socks receive the most wear, these socks will prove to be a durable pair that you can wear for a long time to come. My Mom and I shared two skeins of Malabrigo sock yarn and challenged each other to create a unique two-color design. This is when the idea for my ‘There & Back Again’ sock design was born. Try different color combinations to create your own distinctive transitions! 7.5” (9”, 10.5”) foot circumference. 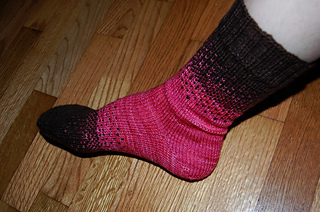 MC: Malabrigo Yarn Sock (100% Merino 440 yards/100g): 1 (1, 1) Skein. Example is Chocolate Amargo. CC: Malabrigo Yarn Sock (100% Merino 440 yards/100g): 1 (1, 1) Skein. Example is Light of Love. Sizes US 1 (2.25mm) 40” circ or 2 circs or size needed to achieve gauge. 34 sts. and 50 rows = 4” (10 cm) in stockinette stitch.